But how could any self-respecting sports fan tune in to the biggest heavyweight fight of the year, and perhaps since Lennox Lewis’ retirement in 2003, and not be vested in the fortunes of one of the towering participants? 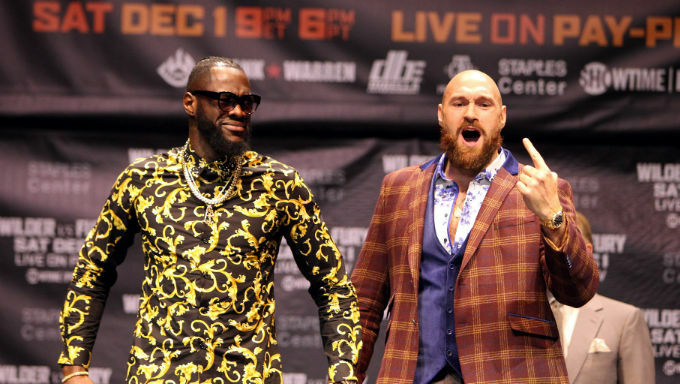 There is a temptation to simplify those intangibles to a more binary comparison and there is merit in the definition of the contest as boxer versus puncher; Fury the more pure pugilist, Wilder the destructive banger. But to this observer, such pigeonholes overlook key factors in the algebra of the puzzle the two fighters present to each other. There is an assumption Fury, who is a best price of 13/8 with Betfair, can only win over the distance and a counter balancing belief Wilder’s route to victory will be by knockout. To rule out the possibility of Fury knocking out Wilder - the 8/13 favourite with Coral - is foolish, as all students of the sport, including retired fighters will attest, anyone hit by a 260 pound fighter, with an ability to counter precisely, can be knocked out. It is unlikely to be the giant former champion’s primary aim, certainly early in the contest, but Wilder offers endless opportunities to do it. Similarly, there can be no assurance of Fury’s ability to box at pace, if Wilder can dictate the tempo with his natural athleticism and willingness to gamble from the outset with clusters of punches. In a busy fight, with high potential for knockdowns and Fury’s gumption to stick in there if Wilder gets on top, there is the prospect of a points win for the 32-year-old American too. From a Distance, Who Succeeds? With fighters of 6ft 9 and 6ft 7, subject to which record you trust, establishing success from range is crucial for both fighters and may hold the key to victory. Fury at his best, though a study of his resume offers few examples when his best is sustained against ambitious opposition it is important to remember, can judge distance brilliantly. He neutralised the jab of Wladimir Klitschko with stunning, if not dramatic effect, and rendered the veteran champion helpless and inert. The difference in this bout is the aggressiveness of Wilder who will not paw with punches nor wait for the perfect opportunity to attack. He will just go for the knockout from the first bell. Launching punches from beyond the usual distance, taking risks and he will bring punches from out wide, over the top and, occasionally straight down the pipe and all without shifting his feet conventionally. It is in this unorthodox style that both his advantage and flaws coexist. Fury will need to be at his sharpest, in terms of reflex and judgement, if he is to avoid these peculiar but devastating punches all night. Wilder, his fans believe, only needs to land one. But in his lack of balance, lack of stability in his footwork, it wouldn’t take much leverage for Fury to knock an over-extended Wilder to the floor, if only momentarily. There is fun to be had in the 75/1 available with William Hill on both Fury AND Wilder to touch down in the opening three rounds. Can Fury Really Be Ready? By the logic of convention and history, Fury cannot be ready for a challenge of this magnitude so soon and by the evidence of what we’ve seen so far, in beating Seferi and Pianeta, he isn’t. If form is your currency, then Wilder, and convincingly, is the most likely outcome. But Fury, in all that he has done, has defied those types of metrics. He had a long lay off before the Klitschko fight in November 2015; he is only 30 years old and will be fitter still after his third camp of the year. Such is the disparity in skill, that Fury will be offered opportunities to score that he would have had to work harder for were he facing even a more modest opponent. The difference is the power he will have to avoid if he is to capitalise on those openings with his hand speed and superior technique. Be neither fooled by Fury’s self-belief nor ignorant to the leap this fight represents from where he’s been since his seminal win three years ago. But, the betting value is in believing in skill over power. Invest cautiously, and perhaps with a view to enjoying the upset a Fury win should surely still represent. After all, to add fuel to the fire of that theory; Wilder can’t jab, can’t move his feet and will be outweighed by 40 pounds on fight night. And he’s never fought anyone like Tyson Fury. But that’s the fan in me talking.